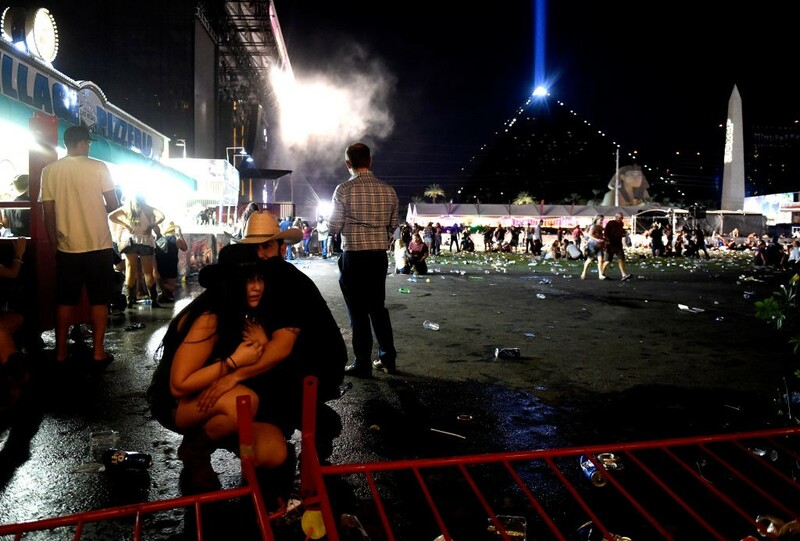 A gunman opened fire on a country music concert outside the Mandalay Bay casino in Las Vegas, Nevada, on Sunday evening. Fifty-nine people are confirmed dead and there are 527 reported injured. The shooter, named as Stephen Paddock, was confirmed dead by Joseph Lombardo, the sheriff of Las Vegas Metropolitan Police Department. 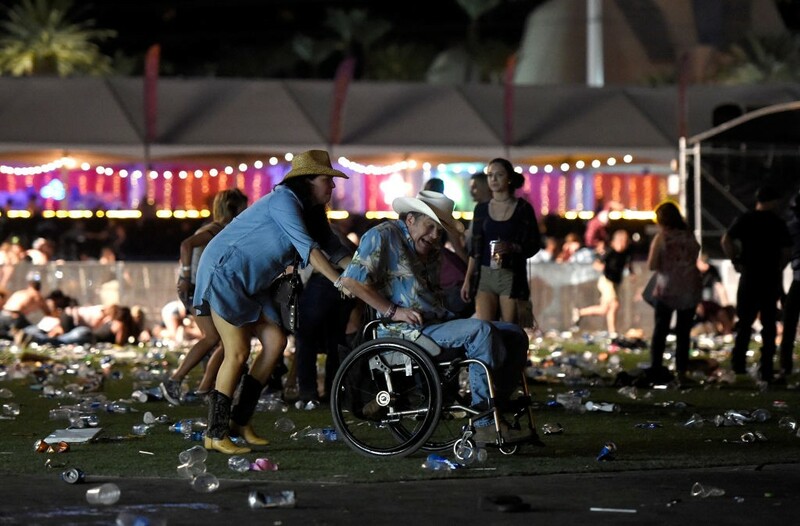 The gunman opened fire on tens of thousands of concertgoers gathered for the Route 91 Harvest country music festival. Update — 10:25 p.m. PDT: As late-night host Jimmy Kimmel lectures Americans about the “gun lobby,” footage emerges of a performance right before the shooting began. Country music stars Big & Rich performed “God Bless America” during their set at the country music festival, just an hour before gunfire rang across the plaza. 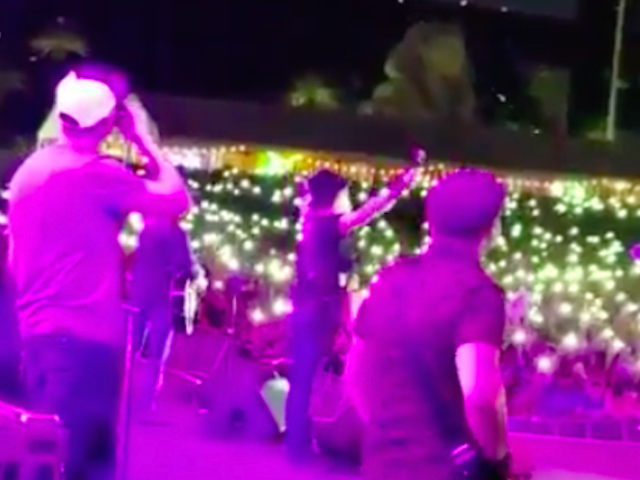 The footage shows thousands of fans holding their cell phones aloft — thousands of lights in the night sky — and singing along. Nearly 600 of those in the crowd would later be wounded, dozens of them fatally so. Update — 9:45 p.m. PDT: The Associated Press reports that the gunman owned two “bump stocks,” legal devices that can mimic the effect of automatic weapons fire when attached to a semiautomatic rifle. It is not known whether he used them in the shooting. Update — 7:20 p.m. PDT: The Las Vegas Metropolitan Police Department announced at an evening briefing that the suspect had been determined to have 23 firearms at the Mandalay Bay, and 19 at his home in Mesquite. The police continued to investigate evidence at the Mesquite home to determine the motive of the killer. He had acted alone, police said. Blood banks had received so many donations that they did not need any more help, they said. The police commissioner said that the department had received $2.2 million from a total of 30,000 donors, after setting an initial target of raising $500,000 as part of a donation drive to support the victims of the shooting. 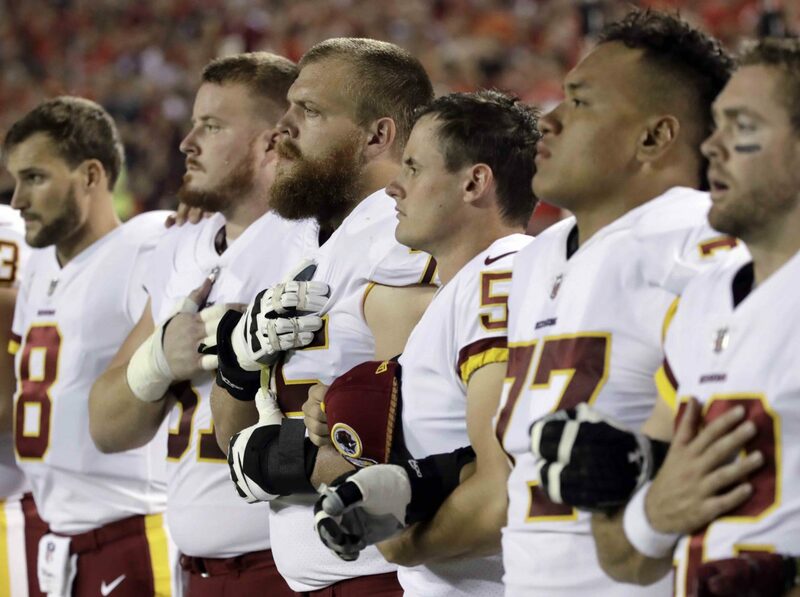 Update — 5:45 p.m. PDT: On ESPN’s Monday Night Football, the entire Washington Redskins squad stood for the national anthem. Most of the Kansas City Chiefs did as well. Two members of the Chiefs, linebacker Ukeme Eligwe and cornerback Marcus Peters, sat for the anthem. Peters was promptly burned by the Redskins’ Terrelle Pryor, Sr. for a touchdown inside the first three minutes of the game. Update — 3:44 p.m. PDT: Roommate Marilou Danley is currently in the Philippines, according to Sheriff Lombardo, and is not believed to have any involvement in the shooting. A “girlfriend” to Paddock is currently in Tokyo, he says. Girlfriend of shooter is in Tokyo, according to @Sheriff_LVMPD. Update — 3:06 p.m. PDT: Casualty count updated again. CNN BREAKING: Police say they retrieved 18 firearms, explosives, and several thousand rounds of ammunition from shooter's home. BREAKING: Brother says Las Vegas shooter was multi-millionaire real estate investor. Clinton and others appear to be assuming that silencers — or “suppressors,” as they’re known in the industry — work the way that they do in the movies. Screw a little barrel on the end of your pistol, and you can run through enemy headquarters picking off bad guys with no more audio footprint than a little zip. Update — 11:17 a.m. PDT: White House weighs in on gun control. Update — 11:06 a.m. PDT: New reports claim number of guns in Paddock’s room was somewhere between 18 and 20. Update — 9:55 a.m. PDT: Breitbart’s Michelle Moons says Trump’s schedule was just updated to include a 2:45 PM moment of silence led by the President and the First Lady. And there will now be an on-camera press briefing at 2 PM with Press Secretary Sarah Sanders. Update — 9:45 a.m. PDT: IDs of victims beginning to trickle out. Update — 9:35 a.m. PDT: Associated Press reports that a woman “companion” of Paddock’s is a person of interest in the investigation of the attack but she is currently out of the country. Authorities say a woman who was a companion of the Las Vegas shooter is considered a person of interest and is out of the country. Sheriff Joe Lombardo didn’t release further details Monday about the woman but said authorities would try to speak with her when she got back to the United States. Diane McKay lived next door to Paddock and Danley until July, when McKay moved to a different community, but said she only ran into Danley occasionally when both women happened to be pulling weeds from the front yard. Danley wasn’t forthcoming about her life, and Paddock was aggressively unfriendly, McKay recalls. She only saw him in the mornings, when he went to the club house to work out. Occasionally, he would open the garage door, revealing a large refrigerator safe. Other than that, the couple kept their blinds closed. McKay said the couple was gone for six months last year, which she thought was for a gambling trip. Paddock’s family said there was nothing in his past that would suggest violence. Family members said that Paddock spent much of his retirement in recent years staying in hotels in Las Vegas and gambling. 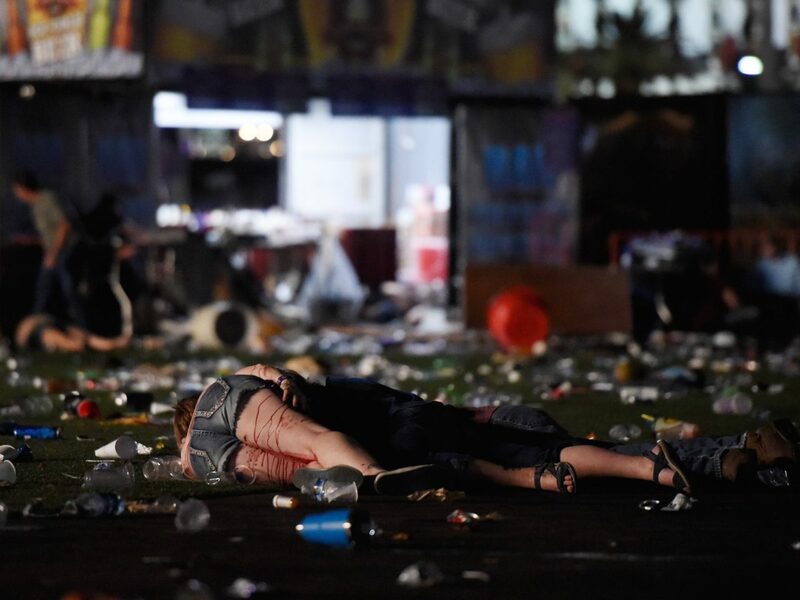 They said he listened to country music and went to concerts at Vegas hotels, similar to the one Sunday night where he opened fire on a crowd of concertgoers. Public records show the gunman Paddock was a licensed pilot who owned two planes. And he had a hunting license from Alaska. Update — 8:17 a.m. PDT: Joe Biden has some thoughts. Security personnel have lifted all restrictions on access to Mandalay Bay and other MGM Resorts. Guests may return to their rooms. Update — 8:08 a.m. PDT: Left has already dropped all pretense of not politicizing the attack. The epidemic of #gunviolence in our country is not preordained. It is preventable. It is time #GOP stops blocking #guncontrol legislation. 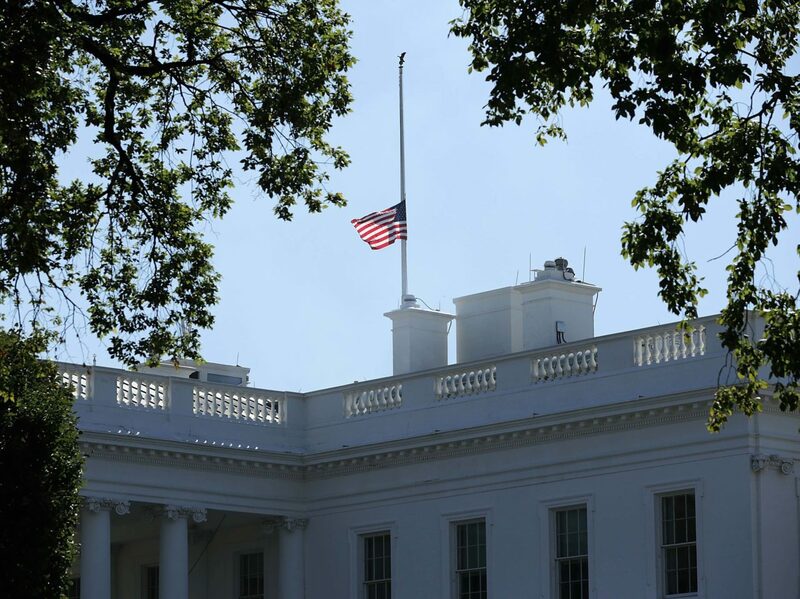 Update — 7:54 a.m. PDT: President Trump orders flags flown at half-staff. Watch his full speech here. Update — 7:46 a.m. PDT: Jeff Sessions reacts. Update — 7:26 a.m. PDT: Ben Rhodes has some thoughts. Update — 7:19 a.m. PDT: Hillary Clinton has some thoughts. Update — 7:14 a.m. PDT: Not likely. But time will tell. TRUMP will address the nation in response to Las Vegas shooting at 10:30 EST a.m. The brother of the Las Vegas shooter said that he was a normal guy who must have ‘snapped’ before carrying out the worst mass shooting in American history. In an exclusive interview with DailyMail.com, Eric Paddock said that ‘something happened’ to make his brother Stephen kill at least 50 people and injure 200. Eric said that there was ‘absolutely no indication he could do something like this’ and said that Stephen had no political or religious affiliation. He said: ‘He was just a guy. Something happened, he snapped or something’. Speaking from his home in Orlando, Florida, Eric said: ‘We know absolutely nothing, this is just, we are dumbfounded. NEW: Police say that the gunman had "in excess of 10 rifles." Update — 5:38 a.m. PDT: Conflicting info — Las Vegas Metropolitan Police Department states in a press release that officers found Paddock dead in his hotel room when they breached the door. Las Vegas Undersheriff Kevin McMahill reports on CNN that there were at least 8 guns in the shooter's Mandalay Bay Hotel room. 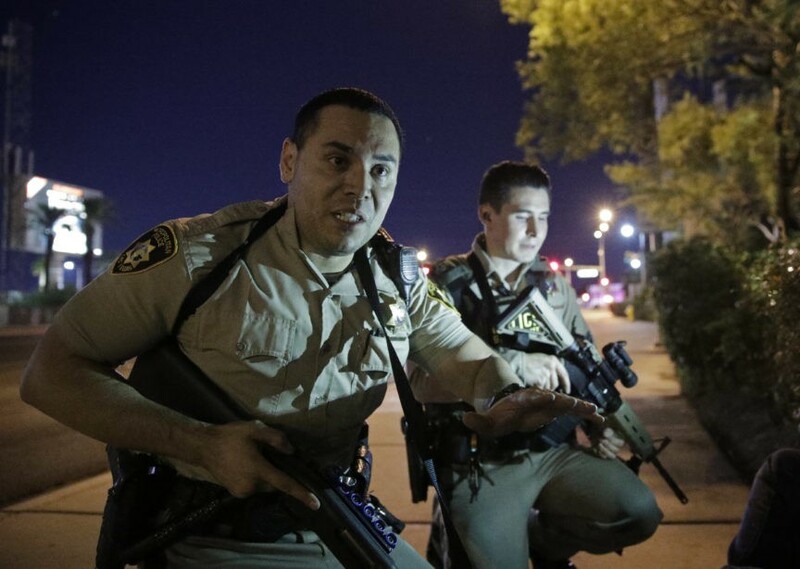 Clark County Sheriff Joseph Lombardo said officers determined the gunshots were coming from a room on the 32nd floor of Mandalay Bay complex on the Las Vegas Strip. Officers stormed the room and killed the suspect, Lombardo said. “Right now, we believe it’s a sole actor, a lone-wolf-type actor,” Lombardo said. He said a motive for the shooting had not yet been determined. Update — 5:06 a.m. PDT: Police have located Paddock’s roommate Marilou Danley and no longer consider her a person of interest. The President has been briefed on the horrific tragedy in Las Vegas. We are monitoring the situation closely and offer our full support to state and local officials. All of those affected are in our thoughts and prayers. …The hearts & prayers of the American people are with you. You have our condolences and sympathies. To the courageous first responders, thank you for your acts of bravery. Update at 3:58 a.m. PDT: LVMPD release contact number to help those looking for family and loved ones. Update at 3:36 a.m. PDT: Main suspect named by LVMPD as Stephen Paddock. Born 4/9/53. He had no criminal record [UPDATE 5:10 a.m. PDT – NBC reports Paddock was “known to local law enforcement,” presumably in Mesquite, NV]. Police confirm 50-plus reported as dead. Another 200-plus injured. Two vehicles being sought have been found. A female person of interest has also been found. Deadliest mass shooting in U.S. history. The hotel posted a statement from MGM Resorts, explaining that all hotels nearby remain in lockdown. Update at 2:26 a.am. PDT: The mayor of Las Vegas, Carolyn G. Goodman, tweeted her gratitude to the first responders who were called to the scene at the Route 91 Harvest Festival. Some of the off-duty police officers attending the event were killed, he says. 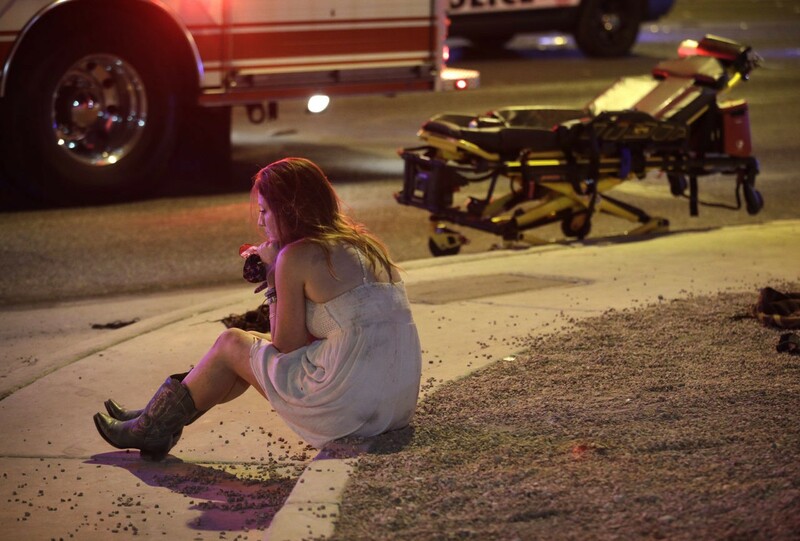 Update 1:05 a.m. PDT: The local Las Vegas Review-Journal reports that a police source says that “at least 20” were killed in the shooting. Country music singer Jason Aldean was reportedly wrapping up his music set when the attack occurred. Video footage posted to social media captures the sound of rapid gunfire. A witness told CNN that “the shots just kept coming,” and that people hid wherever they could, including under parked cars. I15 freeway is closed to traffic at this time from Tropicana to Russell Rd. Again, please avoid the area. According to the New York Times, “several SWAT teams were sent to [Mandalay Bay].” McCarran International Airport, which is just east of the Mandalay Bay, suspended flights in light of the attack. Some flights destined for @LASairport were diverted due to police incident. Please check with your air carrier if flying/picking up tonight.